This story was written by CBSNews.com political reporter Stephanie Condon. The intense debate surrounding health care reform is following lawmakers home this month as they depart Washington for the August recess with a reform bill in limbo. Over the course of the past few months, the rhetoric frcom both the left and the right, from politicians and activists, has been heated and sometimes misleading. With a month with nothing to do but argue, both sides are sure to keep up the partisan and potentially deceitful messages. "The more complicated an issue is, the more easily one can twist and distort the facts about it, and health care is as complicated as they come," said Brooks Jackson, a veteran journalist and now the director of FactCheck.org. His organization, a nonpartisan, nonprofit project of the Annenberg Public Policy Center of the University of Pennsylvania, tracks the factual inaccuracies and misleading statements that thread through political communications. Related: Did Obama Mess Up Health Care Politics? "A lot of the misstatements have stuck with the public," Jackson said. "We're talking about one sixth of the economy and one bill more than 1,000 pages long, so it definitely lends itself to distortion and fear-mongering." It can be complicated for citizens who simply want to follow the issue and know the facts. Here is a look at 10 myths being told by both sides of the debate, and the reality. At a tele-town hall meeting with members of the senior advocacy group AARP last month, President Obama could not help but describe one question he received as "kind of morbid." "I have been told there is a clause in (the health care bill) that everyone that's Medicare age will be visited and told to decide how they wish to die," said a caller named Mary from North Carolina. "This bothers me greatly, and I'd like for you to promise me that this is not in this bill." There is nothing in any health care reform bill before Congress that would require people to "decide how they wish to die." Conservative talking points from activists and legislators, however, would suggest otherwise. This rumor gained traction in large part because of comments from former Republican lieutenant governor of New York Betsy McCaughey. On a radio show on July 16, McCaughey said she had read the bill and discovered that "Congress would make it mandatory... that every five years, people in Medicare have a required counseling session that will tell them how to end their life sooner, how to decline nutrition, how to decline being hydrated, how to go into hospice care... all to do what's in society's best interest... and cut your life short." House Republican Leader John Boehner (R-Ohio) and Republican Policy Committee Chairman Thaddeus McCotter (R-Mich.) put out a statement on July 23 that suggested as much. "Section 1233 of the House-drafted legislation encourages health care providers to provide their Medicare patients with counseling on 'the use of artificially administered nutrition and hydration' and other end of life treatments, and may place seniors in situations where they feel pressured to sign end of life directives they would not otherwise sign," they said. "This provision may start us down a treacherous path toward government-encouraged euthanasia if enacted into law." In fact, section 1233 of the House bill would allow Medicare for the first time to cover patient-doctor consultations about end-of-life planning, including discussions about drawing up a living will or planning hospice treatment. Patients would, of course, seek out such advice on their own -- they would not be required to. The provision would limit Medicare coverage to one consultation every five years. A prevalent conservative talking point is that the proposed government-sponsored health insurance plan, or "public option," could drive private insurers out of business and that millions of Americans would lose their current health insurance. In a letter to the president in June, nine Senate Republicans from one of the committees responsible for health care said "forcing free market plans to compete with these government-run programs would create an unlevel playing field and inevitably doom true competition." The letter cites a study by the Lewin Group that shows that if Medicare payment levels were used in the public plan, premiums would be up to 30 percent less than premiums for comparable private coverage, potentially prompting more than 119 million people to switch from private to public insurance if the plan were open to everyone. The Republican letter characterized this shift in care as "119.1 million Americans losing their private coverage." In fact, that figure represents Americans who would presumably change their plans voluntarily. The bill does not force private insurers out of business or force people onto the public plan. Moreover, that large number represents what shift may occur if the public plan were open to everyone. The legislation in both the House and the Senate, however, would actually prohibit many people with employer-based insurance from switching to the public option, even if they wanted to. The CBO, in fact, estimates the House bill would result in a net increase of 3 million Americans with employer-provided care. On the flip side, Mr. Obama has made a strong commitment to let people keep the plans they have. 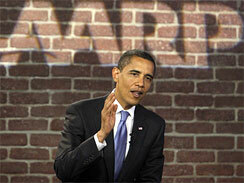 "Here's a guarantee that I've made," the president said at the AARP tele-town hall conference. "If you have insurance that you like, then you will be able to keep that insurance." Democrats would indeed compel employers to continue to shoulder some of the cost burden of health care by creating a "pay or play" mandate, requiring companies to either provide insurance for their workers or pay a fine. However, employer coverage would have to meet certain requirements; for example, plans would not be allowed to charge co-pays for preventive care. It is possible some companies would have to alter their coverage, or would instead choose to drop their coverage all together and pay a fine. When the self-described fiscally conservative Blue Dog Democrats negotiated a compromise with Democratic leadership over certain elements of health care reform, they won headlines such as "House Democrats Trim $100B from Health Bill." "I think, rightly, a number of these so-called Blue Dog Democrats -- more conservative Democrats -- were concerned that not enough had been done on reducing costs," Mr. Obama said in an interview with CBS News. Indeed, the Blue Dogs convinced their Democratic colleagues to cut government costs by reducing the amount the government will spend in subsidies to make health care more affordable for low- and middle-income Americans. The compromise also shifts some of the cost of expanding Medicaid from the federal government to the states. However, the compromise also would require the government-sponsored health insurance option that would be created to negotiate its own payment rates, rather than using Medicare payment rates. This would create a more level playing field for private insurers, Blue Dogs said. The compromise also exempts more small businesses from the "pay or play" mandate, giving businesses a smaller share of the cost burden. Politico reported that, according to a CBO preliminary analysis, the cost of those two changes would almost completely offset the $100 billion achieved in savings. "Allowing doctors and other health care providers to negotiate rates with the government under a public option would cost the government about $60 billion, according to a preliminary CBO estimate," Politico reported. "And exempting small businesses with a combined salary of $250,000-a-year to $500,000-a-year would cost the government $30 billion, according to the same estimates." Anti-abortion rights advocacy groups and legislators alike have complained that the health care legislation includes a "hidden abortion mandate," as some congressmen have put it. 5160169In late June, 19 Democrats sent a letter to House Speaker Nancy Pelosi calling the issue a deal-breaker. "Plans to mandate coverage for abortions, either directly or indirectly is unacceptable," they wrote. The letter specifically referred to the "essential benefits package" a Health Benefits Advisory Committee and the Secretary of Health and Human Services would be responsible for defining. Nothing in the legislation, however, has "mandated" that abortion services be included in the benefits package. In fact, the House Energy and Commerce Committee on Thursday adopted an amendment, proposed by Rep. Lois Capps (D-Calif.), that would prohibit taxpayer dollars from funding abortions. The amendment would not allow the federal government to either require or prohibit abortion coverage by private insurers. It requires at least one plan from the federal health insurance exchange in each region of the country to cover abortion, and at least one of the plans to not cover abortion. "Private health care providers are free to cover abortion, but not with federal funds," reports Dan Gilgoff of U.S. News and World Report. "The public plan would cover abortion, but not with federal funds; a Capitol Hill aide tells me money for abortions would come from what participants pay into the public plan." It has yet to be determined how this issue will finally be settled. Mr. Obama told CBS Evening News anchor Katie Couric in July that "I'm pro-choice, but I think we also have the tradition in this town, historically, of not financing abortions as part of government-funded health care." Go to page 2 to see myths 6-10. "Health insurance reform cannot add to our deficit over the next decade, and I mean it," Mr. Obama has said on numerous occasions. Lawmakers are still grappling with ways to pay for the large cost of expanding health care to all, but they will use at least one accounting trick to make the legislation appear deficit-neutral over 10 years. As part of the proposed reform package, Democratic legislators want to reform projected Medicare payments to avert a 20 percent pay cut to doctors -- creating $245 billion in new costs that have not been accounted for. Democrats argue it does not have to be paid for because they already exempted it from congressional "pay-as-you-go" rules, the AP reported. Furthermore, while lawmakers focus on trying to create a bill that is deficit-neutral over 10 years, the longer-term costs may be even more difficult to predict. The Congressional Budget Office recently concluded that the legislation under consideration in both the House and Senate would not control costs. "In the legislation that has been reported, we do not see the sort of fundamental changes that would be necessary to reduce the trajectory of federal health spending by a significant amount," CBO Director Douglas Elmendorf told Congress last month. "And on the contrary, the legislation significantly expands the federal responsibility for health care costs." The day after Elmendorf's testimony, the president proposed a scheme to establish an independent, non-partisan commission of doctors and other health experts to oversee the costs of Medicare. He said the plan would "bend the cost curve so we're not seeing huge health care inflation." In a setback for Mr. Obama, however, the CBO subsequently said that creating such a commission would produce only about $2 billion in savings over 10 years -- a relatively small figure for a reform plan expected to cost around $1 trillion. Mr. Obama has said that there will be savings from the efficiencies implemented into the nation's health care system through the legislation, but those savings are impossible for the CBO to score. Republicans have blasted Democrats for planning cuts to Medicare, a program that benefits millions of seniors. 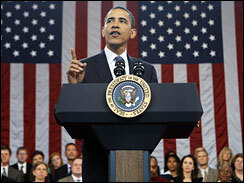 President Obama has insisted that there will be no reductions to benefits. Technically, Republicans are right that health care reform plans include cuts to Medicare's projected budget; however, Mr. Obama has given specific examples of how cuts can be made by rooting out waste from the program. "Some in Congress seem to be in such a rush to pass just any reform, rather than the right reform, that they're looking everywhere for the money to pay for it, even if it means sticking it to seniors with cuts to Medicare," Senate Minority Leader Mitch McConnell said recently, the Associated Press reported. In the House, Rep. Mike Pence (R-Ind. ), chairman of the Republican Conference, gave his colleagues talking points about the Democrats' "harmful cuts" to Medicare that would "result in millions of seniors losing their health coverage," according to the New York Times. The House bill reduces projected increases in Medicare payments to providers by more than $500 billion over 10 years, the Associated Press reports, but puts nearly $300 billion in new provider payments back into the program (as explained in myth No. 7). That creates a net cut of $200 billion. "What we hear from our members is that to them Medicare savings sounds like cuts," Nora Super, AARP's chief health care lobbyist, told the AP. "Our members over 65 really value their Medicare program ... and numbers like $500 billion are huge numbers, so that is really scary to our members." Mr. Obama said at the AARP tele-town hall meeting in July that there is no discussion of cutting Medicare benefits. "Nobody is talking about reducing Medicare benefits," he said. "What we do want is to eliminate some of the waste that is being paid for out of the Medicare trust fund that could be used more effectively to cover more people and to strengthen the system." As an example of waste, he pointed to the 10-year cost of $177 billion in subsidies paid to insurance companies to allow them to participate in Medicare Advantage. "So what we've said is let's at least have some sort of competitive bidding process where these insurance companies who are participating, they're not being subsidized on the taxpayer dime," the president said. "If they got better services -- they have better services that they can provide to seniors rather than through the traditional Medicare program, they're free to participate, but we shouldn't be giving them billions of dollars worth of subsidies." Republicans have consistently berated the proposal for a government-sponsored health insurance plan, or "public option," as unpopular. "The American people oppose a government takeover of health insurance, and they know if the Democrats and the administration get their way and create a new government-run plan, tens of millions of Americans will lose their health insurance," Rep. Mike Pence (R-Ind. ), chairman of the Republican Conference, said on Fox News Sunday. A statement from House Minority Leader John Boehner's web site reads, "Americans want lower health care costs - not a trillion-dollar government takeover of health care that increases costs and lets Washington bureaucrats make decisions that should be made by doctors and patients." In fact, a CBS/ New York Times poll from late July shows that, even though doubts have grown in recent months about Mr. Obama's health care proposals, 66 percent of Americans still want the government to provide a health insurance plan like Medicare to compete with private health insurers. One of the misleading buzzwords in the health care debate is "rationing" -- the idea that patients will have limited treatment options if the government becomes more involved in health care delivery. "What (the Democrats' plan) is going to do is ration care, limit the choices that patients and doctors have and really decrease the quality of our health care system," House Minority Leader John Boehner said at a press conference. Rep. Mike Rogers (R-Mich.) suggested in a television interview that he might have died as a young man if he had been insured by a public plan because he suffered from bladder cancer at the age of 19. "The only way the government can control costs is by denying you things, by rationing care," he said. "They will ration care, because it's the only way they can do it." In fact, Americans will not face "rationing" in health care any more than they do now. While a public plan would not be able to cover all procedures, private insurance plans do not either. "We don't want to ration by dictating to somebody, 'Okay, you know what? We don't think that this senior should get a hip replacement,'" Mr. Obama said at the AARP tele-town hall. "What we do want to be able to do is to provide information to that senior and to her doctor about this is the thing that is going to be most helpful to you in dealing with your condition." Democrats have created a misleading sense of urgency over health care reform. The president has spoken about suffering Americans who need help right away. It is a talking point more commonly used by liberal grassroots groups rallying support. The liberal Web site FireDogLake cited data recently suggesting that during the span of Congress' three-week vacation, 43,250 people will lose their health insurance coverage, 53,507 people will file for bankruptcy because they can't pay their medical bills, and 1,265 people will die because they lack coverage. The liberal group MoveOn.org took the same tactic -- highlighting how much damage can be done in three weeks -- to promote a petition. However, significant provisions of the health care legislation under consideration -- including the federal health insurance exchange, the public option, subsidies and the employer mandate -- would not go into effect until 2013. Mr. Obama addressed this fact at an Ohio town hall. "Most of these changes would be phased in over several years," he said. "So it's not as if you're going to wake up tomorrow and suddenly the health care system is all changed completely. We are going to phase this in, in an intelligent, deliberate way." © 2009 CBS. All rights reserved. Stephanie Condon is a political reporter for CBSNews.com.